My friends have learned that in July and August, I am busy with the museum, thus, not allowing time to go camping and hiking. Also, the best time to “do Grand Marais,” as we locals call it, is in the spring and the fall. The visit from my friends Marsha and Denise provided opportunity for me to camp at 12-mile beach for a night, as well as to hike the Lakeshore. 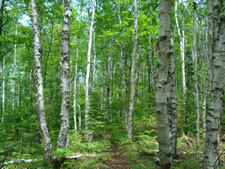 Ever since I was a kid, I’ve enjoyed camping at 12-mile, wherein you a surrounded with one of the most magnificent stands of white birch. 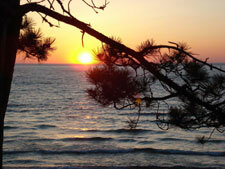 The slight northeast angle of the shoreline at 12-Mile Beach provides one of the best views of Lake Superior sunsets. 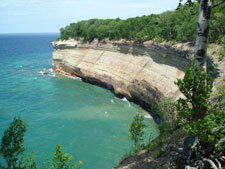 It has been several years since I hiked the Lakeshore trail west of Mosquito Beach. It was a brisk clear day which provided perfect hiking weather for us to enjoy the Chapel Parking to Minor’s Beach section of the Lakeshore trail.